Apples on a boat? This wallpaper is what was on her when we purchased her. 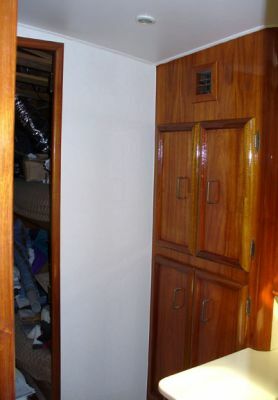 The boat was once named "Abbey Road" and we can only think that the previous owners were avid Beatle fans. 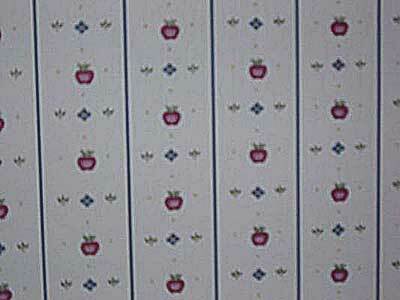 Although we enjoy the Apples Label music, the wallpaper has to go! The apple wall paper has finally been removed from the Master Stateroom head. To make removal of the wallpaper easier, we used a fabric softner and water mix - a good trick taught to us by Stacey's mom. Wallpaper has been installed. The edges have been caulked. The headliner has been trimmed out with Hydem vinyl strip fabric. Paint was applied to the back wall in order to seal the wood; and screw holes were filled in. Next, it was sanded and a second coat of paint applied. We'll be applying a vinyl art scene to the back wall while the end walls will have had white vinyl installed. The small area at the top was made to house the wires for the VIP TV and has been painted with gloss white. The guest head wallpaper on, edges caulked and Hydem vinyle strip fabric installed on the headliner. Another photo of the guest head. 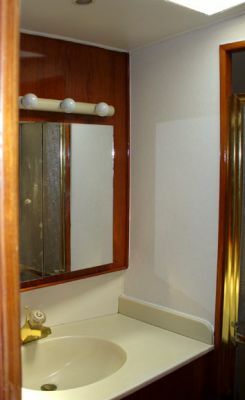 Entering the Master Stateroom and looking into the head you now see the tub wall image reflected in the vanity mirror. 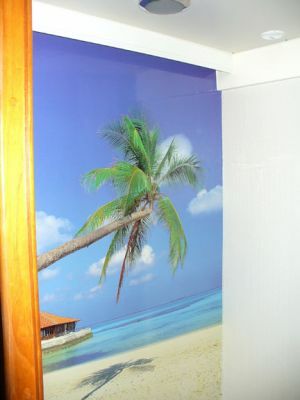 This printed and laminated scene has been applied to the tub wall. 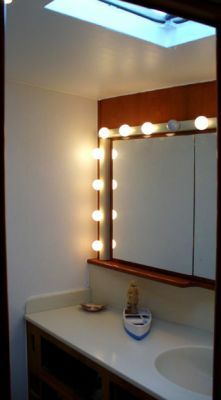 The valance light shines on it with the total picture brightening and opening up the area. 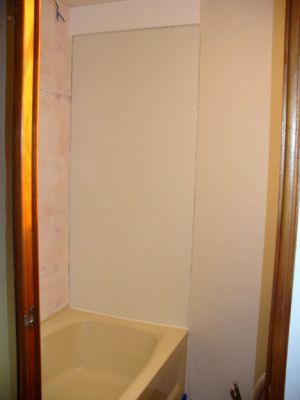 We can take a bath while looking at the beach and think about going to the TIKI bar.